The Broadcasting Authority of Ireland, that august body which in July last year said of Denis O’Brien “the Authority determined that Mr. O’Brien does not control IN&M. Rather he has a substantial interest in the Company, as that term is defined in the Policy.” has this week produced a new set of guidelines for broadcasters. The nation’s most popular presenter – yes, his ratings are only 170,000 viewers but that’s because the complete clowns responsible for scheduling at TV3 stick it on at 11.15pm each night, when most of us have gone to bed – Vincent Browne may have to consider his future in broadcasting, because it is the expression of his own views which forms 50% of his appeal, with the filleting of explainers providing the other 50%. Under new rules, which are seemingly operational now, Vincent will have to be very careful to avoid expressing his own views, and the betting is that he will be as unsuccessful as a first-timer on that game where you have to speak for 60 seconds without saying “em”. This week he poked fun at the new rules, laughing it off saying “someone else (wink) might say”, but these new rules will hamstring him. Maybe time to abandon broadcasting and embrace narrowcasting on the web, where the BAI and communications minister Rabbitte are powerless. 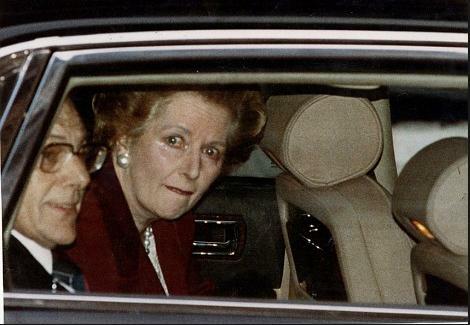 “Tramp the dirt down..Thatcher described Nelson Mandela as a “terrorist”. I was there. I saw her lips move. May she burn in hellfires” British MP, George Galloway – the phrase “tramp the dirt down” is lifted from the Elvis Costello song of the same title – lyrics here. Margaret however has the last laugh on this one, as she’s going to be cremated according to reports. Sean Dunne might portray himself as the Ace of Spades in the NAMA most-wanted list, but it seems he is lowly number 39 on NAMA’s league table of biggest borrowers which would place him in the four rank. Now, you might all recall that Saddam Hussein was the Ace of Spaces, el numero uno but can you remember those at positions 38-42? There were three anonymous Ba’ath Party regional command chairmen and the minister of higher education and scientific research. And that’s where Sean Dunne is ranked. These are the NAMA top debtor rankings – Sean owes NAMA €185m and is believed to owe €400m overall to creditors including Ulster Bank. 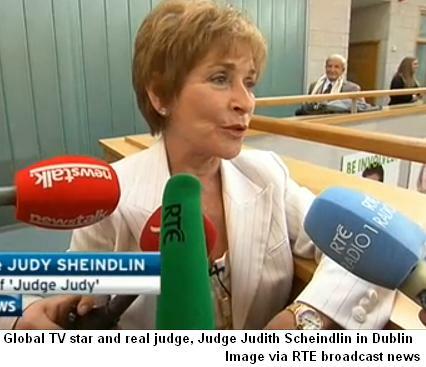 US daytime TV star, Judge Judy was in Dublin this week when she picked an award from the enterprising students at UCD. Not surprisingly, given how good TV has been to her, she called for proceedings in some Irish court cases to be broadcast. One day, maybe. But meantime, we might settle for the Court Service providing some basic information about its court cases. Take this one, reported on here, where NAMA was shown as suing an individual only identified as “STACK GEMMA”. Seems that Gemma is in fact a solicitor, and the Court Service has now changed the respondent to “STACK IN HER CAPAC AS LPR KEVIN FITZSIMONS DECSD GEMMA “. Because the Court Service doesn’t provide ANY additional information on its court cases, other than that shown on its website, poor Gemma has suffered suspicion for a couple of weeks that it is her personally that NAMA is suing. RTE commissioned a “aren’t we great” report from PwC in advance of announcing what are likely to be record losses for 2012. 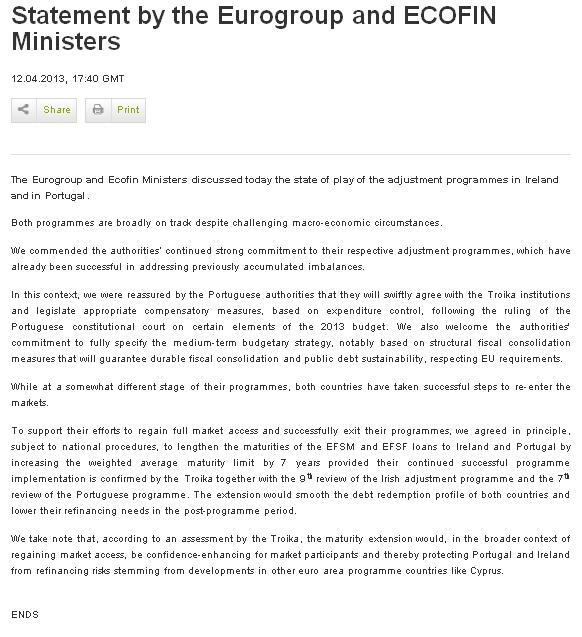 The PwC report supports RTE’s whinge that its funding has been substantially cut in recent years, and it seems that there has been a cut of 20% between 2006-2011, and tries to “big up” RTE’s performance and its contribution to the nation. It is an unashamed promotional report despite its claim of independence and it arouses suspicion that the results for 2012, which are expected to be announced imminently, will be worse than ever with a deficit of €50m and a loss on the pension fund in the tens of millions. 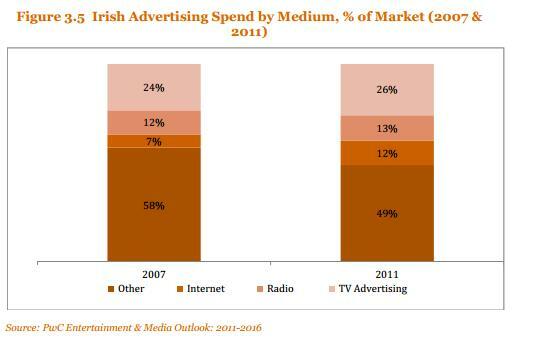 There are some interesting statistics in the report though, and above we see the collapse in the advertising market between 2006-2011. And below we see the breakdown of that advertising, with the Internet contributing to old media’s woes by taking spend away from traditional media. 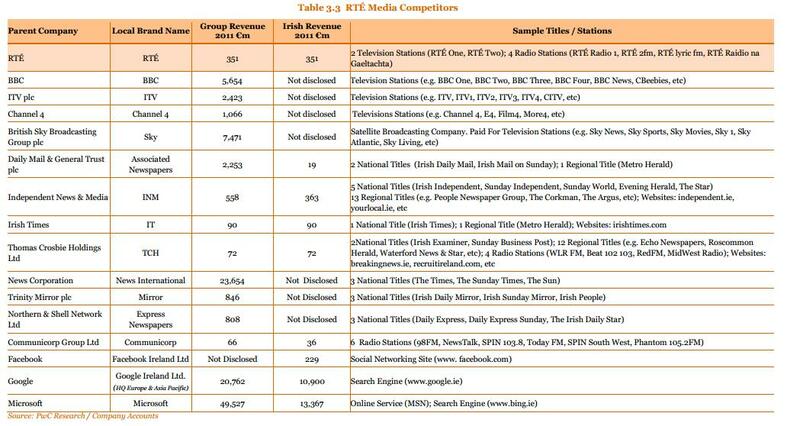 The report also sets out RTE’s competitors though there are glaring omissions like TV3, TG4, UTV and Distilled Media, publishers of Daft.ie and TheJournal.ie – it was interesting to see that half of Google’s worldwide revenue arises in Ireland, though we all recognize that is for tax avoidance reasons. 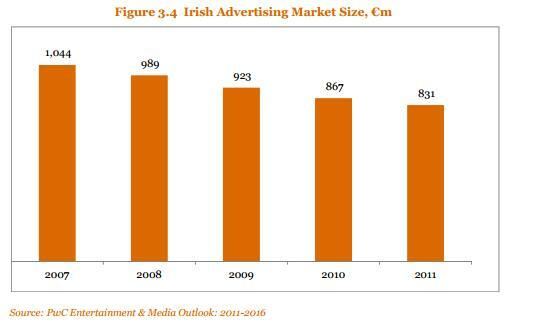 Also interesting that the Irish Daily Mail and Irish Mail on Sunday only generate €19m in Irish revenue. Political correspondent at the Irish Examiner, Juno McEnroe, has been doing some real journalism as he investigated how widespread the quashing of penalty points has been in the Oireachtas. He contacted all TDs and most responded, though there were notable senior exceptions including An Taoiseach, Enda Kenny. He uncovered one case where penalty points were imposed on the wife of a TD because the wife had failed to send a document to the Gardai saying it was not her, but her husband driving at the time the offence was committed. In other countries, this investigative journalism would have led to wall-to-wall coverage in broadcast media but in Ireland, the death of Margaret Thatcher (87) dominated reporting. In the UK recently, a minister and his former wife were both jailed when they proactively sought to mislead the police by having penalty points allocated to the wife who hadn’t committed the offence, but in Ireland, there was more deafening silence when the same result – penalty points being imposed on the wife of the true culprit – occurred with Andrew Doyle and his wife, though they both claimed it was because of an oversight . The Independent Kerry TD Michael Healy Rae was one of the 166 not to respond to questions, though he refused in his own unique way. If you start off with the proposition that the national debt is fixed, then the only way to cushion the effect of living with and repaying the debt is to get an extension of time or a reduction in interest rates. Yesterday, the group of finance ministers from the 27 EU countries, known as “Ecofin”, agreed to extend the period over which Ireland repays its €45bn EU component of the €85bn bailout by seven years. No word on interest rates, yet, but Minister Noonan is heralding the agreement and claims that the only ratings agency to continue to rate our sovereign bonds as junk, Moody’s, will soon restore our investment grade rating. This should all be good news, as it does indeed cushion the effect of the debt which is predicted to peak at 121% this year. 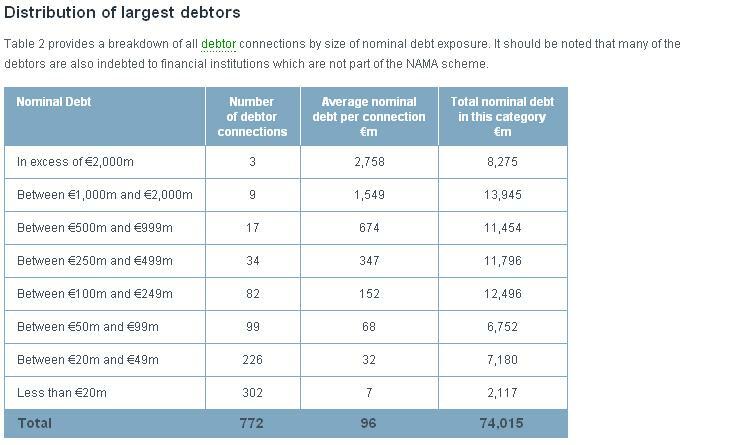 But the view on here is (a) with NAMA crystallizing loan losses at IBRC debt will rise to 123% and (b) it doesn’t address calls about repudiating some of the debt. Last Saturday’s Irish Lotto draw has resulted in some additional winners. The Lotto draw overseen by a representative of KPMG, had a ball with the number 9 printed 12 times on it. Because of the risk of confusion between 6 and 9, this particular ball was underlined to make it clear it was number 9, but one of the 9s on the ball had the underline on top indicating a 6. Punters eagerly watching the draw were confused when the presenter called the ball initially as a 9 and then as a 6. The An Post National Lottery Company issued a notice in which it acknowledged the mistake but promised to pay out to ticket holders with either a 9 or a 6 and acknowledged that the mistake is estimated to cost a maximum of €54,000. Neither the Lottery nor KPMG were answering follow-up questions about responsibility – my theory is this is the KPMG auditor in a former life. On 10th April, the Central Bank issued a new commemorative €10 coin (price €46) featuring an impression of James Joyce and a line from Ulysses. Somehow a small mistake by the bank of inserting the word “that” into one of the two sentences of Ulysses text, generated headlines worldwide – at one point, it was the fourth most popular story on the BBC’s website. Now, the old media can sometimes be sniffy about careless grammar standards in the new media, which is rich. 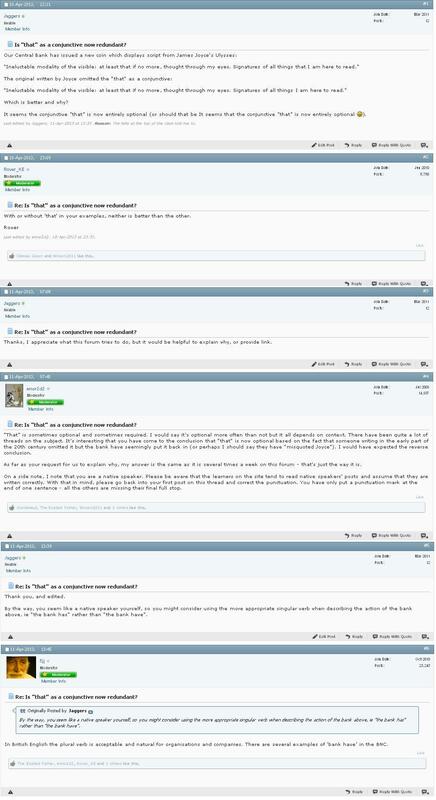 And on here, a variety of forums are consulted on matters of grammar and language generally. And so, in this case, the community at English Forum was asked about the erroneous addition to Joyce’s script on the coins produced by the Central Bank. Sadly, even the new media can get sniffy and it seems some people can take offence at being challenged, with a response from here to the last comment below, suppressed, when all it did was link to the BBC World Service “Using English” sub-website and pointed out that collective nouns, like bank, take singular verbs when the noun is considered as a unit rather than a group of individuals. 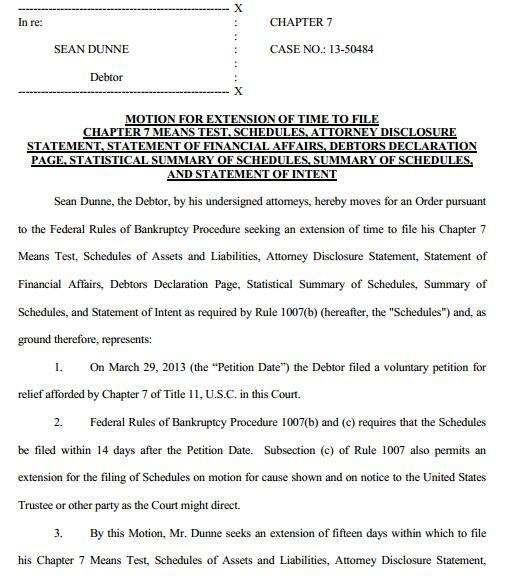 Yesterday in the Connecticut bankruptcy court, the lawyer acting for Sean requested an extension of time to file these all-important documents, which were due yesterday. The requested extension was to 27th April 2013 and the extension was granted by the court. There are fingers being tapped in anticipation on both sides of the Atlantic. The greatest impression of the report on the public consciousness might be the relationship between former communications minister Michael Lowry and telecoms businessman Denis O’Brien during the award of the State’s second mobile phone licence in 1995. But there were other elements to the report and one involved entrepreneur Ben Dunne and a property he owned on Marlborough Street in Dublin city centre which was rented to Telecom Eireann, a state company ultimately under the aegis of Michael Lowry as communications minister. The Tribunal heard from estate agent, Mark Fitzgerald, managing director of Sherry Fitzgerald and son of Garret Fitzgerald, former Fine Gael taoiseach, of alleged attempts by then-minister Lowry in 1995 to influence the estate agent which was acting as arbitrator in setting a new rent for the building. It was alleged that on at least two occasions, then-Minister Lowry had sought to influence the boss of the estate agency to double the rent from IRL 5 to IRL 10 per square foot. Ben Dunne owned the building and had donated large sums to the Fine Gael party, the political party of which Michael Lowry was then a member, and Ben Dunne had also directly benefitted Michael Lowry through the payment for building works at Michael Lowry’s home in Tipperary. It should also be said that specific dramatis personae, notably Michael Lowry and Denis O’Brien, reject in strong terms, the findings of the Tribunal. So, more than two years after the publication of the Moriarty Tribunal report, and after the report was given by An Taoiseach to the DPP and An Garda Siochana, Ben Dunne says he has not heard from the DPP, or presumably from the Gardai. This is unfair on both Irish society and Ben Dunne (and indeed Michael Lowry and to an extent, Mark Fitzgerald). Remember, Ben Dunne hasn’t been convicted of anything and he says he doesn’t believe he has done anything wrong but he still has a report of some considerable standing, making serious findings against him. How difficult can it be for the Gardai to investigate the matter, take statements from Messrs Lowry, Dunne and Fitzgerald and to decide if an offence has been committed? Something is putrid here. Either the Gardai are underresourced or incompetent, or for whatever reason, not doing their job, or the DPP is underresourced or incompetent, or for whatever reason, not doing its job. We have a separation of powers of sorts between politicians and the police service and the DPP and there may be a reluctance to hold either to account by politicians, particularly in a case which has a political angle and where there may be accusations of political interference. But if ministers cannot hold them to account, who can? Will Minister Shatter call in an independent investigation service, perhaps from overseas? It would be uncomfortable to think that the Gardai or DPP can be forced to dance to the tune of the media, but at what point can we conclude their performances are just undermining trust in public institutions; have we already passed that point?